CM Magazine: The Toad. (Disgusting Critters). 32 pp., hardcover & epub, $12.99 (hc.). ISBN 978-1-77049-667-5 (hc. ), ISBN 978-1-77049-669-9 (epub). The toad sometimes sheds her skin to keep it healthy, and that�s kind of gross. It means she gets rid of the old skin and then�. SHE EATS IT! EWWWW! 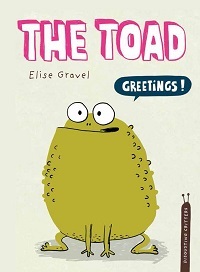 The Toad, by award-winning author Elise Gravel, is a nonfiction early reader book suitable for K-2. It is part of the �Disgusting Creatures� series which also includes The Worm, The Fly, The Rat, The Slug, The Spider and Head Lice. The drawings are simple cartoons, and there are few words per page. The Toad combines comic elements with information. It reads a little like a comic book and is sure to make kids giggle with its gross-out facts about toads. One of the highlights of the book is the toad eating her skin with a bottle of ketchup and a giant �Ewww!� speech bubble. I have a five-year-old in my house who, after reading this book, went around quoting this page for the rest of the day. The Toad blends together what would otherwise be dry facts about animals with comedic pictures and captions, capturing the imagination, so that children can retain knowledge. My only complaint is that The Toad lacks a glossary at the end to explain some of the terms within the book, words like habitat, pesticides, global warming and pollution, which younger children may need explained. With its nonrealistic drawings and lack of glossary, this book seems like it would be best for recreational reading or as supplemental to a classroom discussion on toads. The Toad would be a great addition to any collection. Jan Moffett is a library assistant for the Newfoundland and Labrador Public Libraries in St. John�s, NL.